Disclaimer: Since I share great projects with you, this website contains affiliate links for my favorite products used. I’ll receive a small commission if you make a purchase but it will not affect your price. This is not a paid endorsement for any products. Thank you for supporting me! 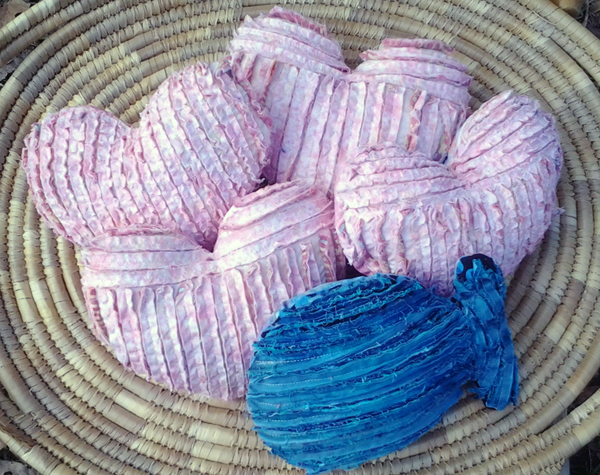 What’s Valentine’s Day without a pretty, little chenille heart for your favorite sweetheart? 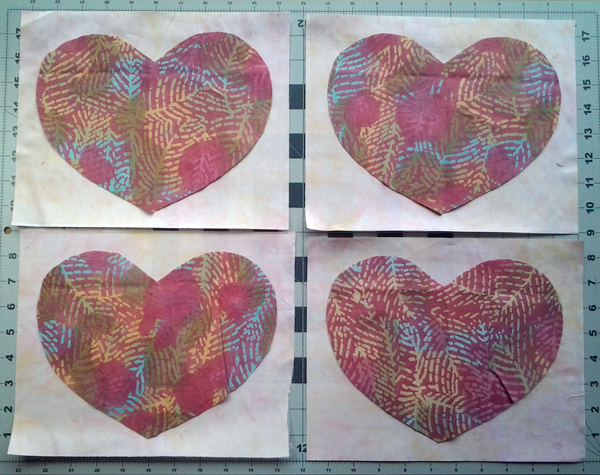 Here’s an easy Valentine’s Day Stash Quilting project you can finish today. Your fat-quarter stash is sure to have a few fabrics to draw from, and there’s always some fiberfill trying to escape from its container. This adorable chenille heart is so soft and cuddly, your Valentine will love it! Add a ribbon to hang for all to see, or leave it as is to soften the cheek of your sweetheart. 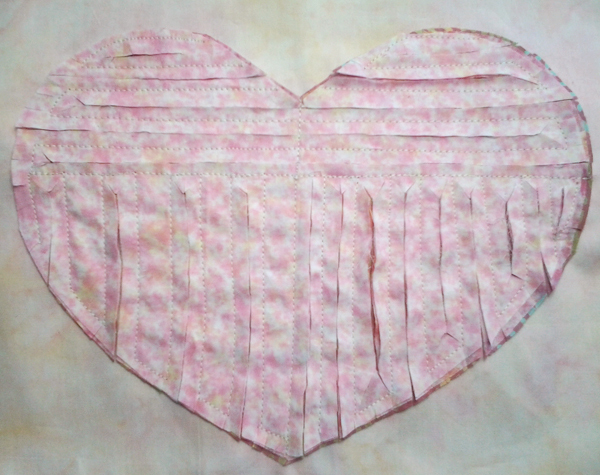 This cute faux-chenille heart pillow pattern draws fabric from your stash quilting pile. It makes 4 pillows using only 5 fat-quarters. It’s a cinch to make and will convey your love beautifully! Of course you only need to make one, but since there’s enough fabric for four you can make all your Valentines happy. Trim your front and back FQ’s to measure 18″ x 22″. Fuse a piece of lightweight interfacing on the back side of the pillow front. This will reinforce all the stitching that will be done on the pillow top. Stack you pillow front and back FQ’s on top of each other. Cut in half each direction so you’ll have four rectangles measuring 9″ x 11″ each. Set aside. 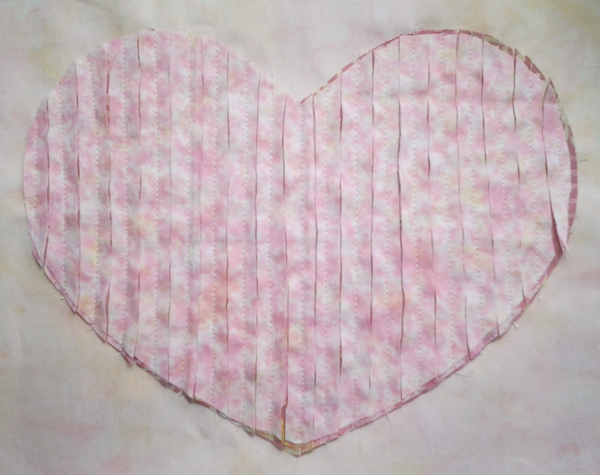 Make your own heart pattern or download my pattern below to cut out your hearts. Working with one FQ at a time, fold your fabric into fourths and trace pattern onto the top layer, being sure your heart is straight with the grain. Do not place it at an angle or you’ll be cutting on the bias and won’t get the chenille effect we’re looking for. Pinning to hold all four layers together, cut around the pattern and you’ll have four hearts cut out. Do the same with the other two FQ’s. 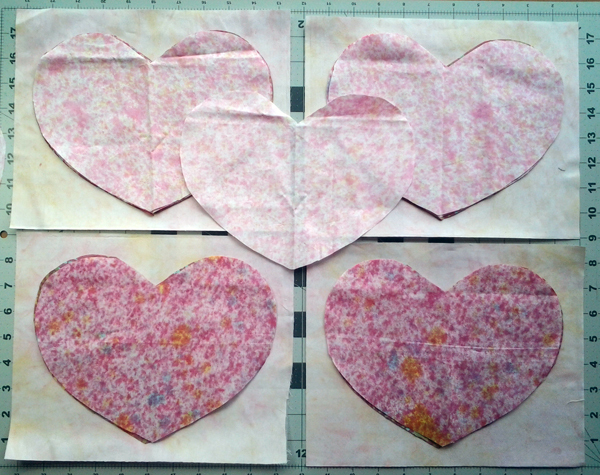 You now have 4 hearts cut from 3 different fabrics along with some small bits for another project. Layout all four of your pillow fronts with right sides up and the interfacing down. 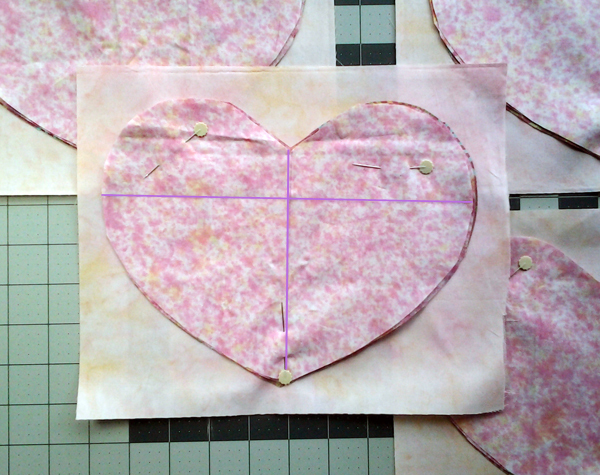 Stack your heart cutouts on top of the pillow fronts being sure to center them within the rectangles. Maybe even switch the order of the fabric around for each pillow for different looks. You may also use the back sides of some fabrics for a lighter color. Once you’re satisfied with the layouts, pin the hearts in place. Decide which direction you want to sew and cut your chenille, then draw an initial line or two to get you started. Take a look at my examples for some ideas. Remember, keep your stitching lines on the grain of the fabric, not the bias or you won’t get the chenille effect once it’s cut. Start by sewing along the line you drew on your heart. 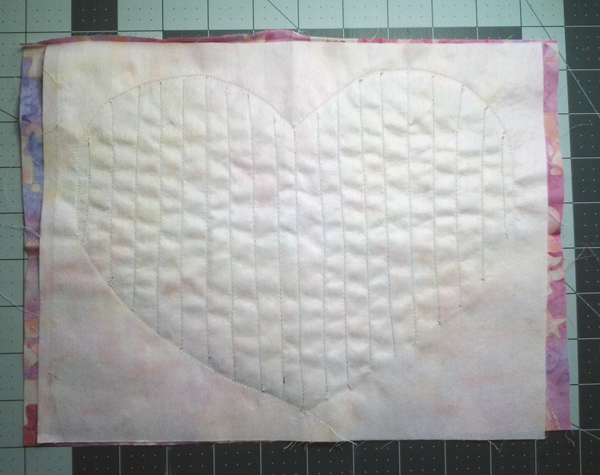 Then turn your heart and sew in the opposite direction, stitching 1/2″ from your first line. Continue in this manner until the entire heart is stitched, then the cutting begins. Cut down the center of each sewn area from one side to the other, being careful to only cut through the top three layers. Do not cut through the pillow top fabric. When these cut strips fray, you’ll begin to see the chenille come to life. 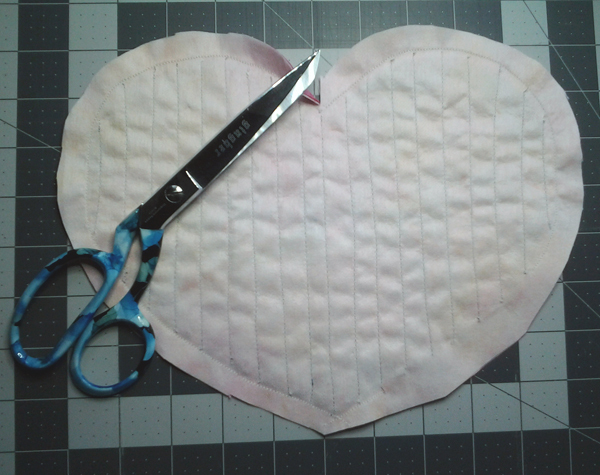 Lay the heart pillow top with the interfacing side down and the heart facing you. Place the back fabric on top with the right side facing the heart and the wrong side facing up. Pin each side to hold in place. For heart shaped pillows sew around the outside edge following your previous stitching lines. Leave a 3″ opening so you can stuff the pillow with fiberfill later. 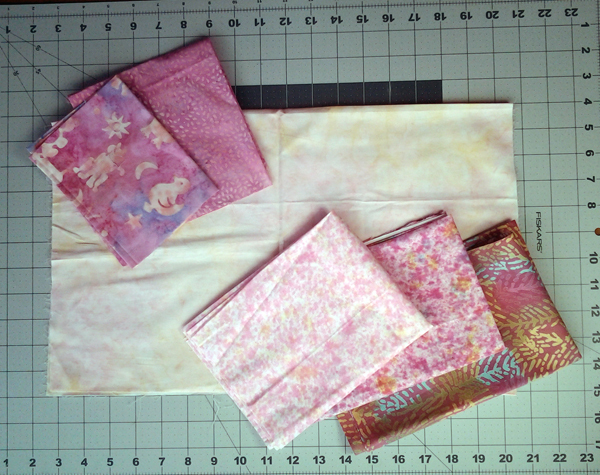 For a rectangle pillow, simply sew a 1/2″ seam around all four sides, leaving a 3″ opening to turn. Trim a 1/2″ seam allowance from where you sewed your pillow. I like to leave a bit wider allowance where the opening is so there’s more fabric to turn. It seems to stay put better while I’m hand stitching it closed. 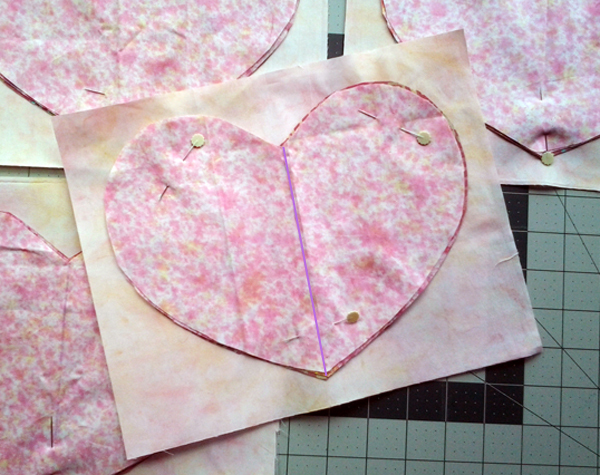 Also snip 1/4″ into the seam allowance in the top corner of the heart so it will turn smoothly. Now you need to wash this little cutie to get the fuzzy chenille look we’re going for. Turn it right side out so it’ll get a good workout in the washer and dryer. Once you pull it out, you should see a sweet little heart on a ready-to-stuff pillow. It’ll be covered with string, so be sure to trim it off. Stuff each pillow firmly with fiberfill so it will hold its shape well. Once you’re satisfied with how it looks, slip stitch the seam closed and your pillow is finished. You can dress your new pillow up as fancy as you’d like with ribbons, laces and buttons. I used quilting fabric for my pillows, but you could use flannels for a softer look and feel. Or you could easily make the back using fleece printed with a favorite character for a little one. Wouldn’t a mobile with lots of little chenille hearts look awesome? So many ideas! Have fun with this project and be sure to post it on Instagram #createsomethingbeautifulyeveryday so I can see it. Since I am all about stash quilting, I can’t let bits of pretty fabrics go to waste. Here’s another variation for the above pillow that you might like to try. Wanting a little pillow for a boy, I decided to make a fish rather than a heart. Pulling lots of blues, I found a fabric front and back, then added lots of bits for the fish. Using a simple fish outline, I filled in each layer with multiple fabrics. Since each layer has many pieces of fabric, I overlapped them about an inch to be sure every piece was caught by the stitching. The best part is all the color variations you can add. This one is great fun to make.